You will know in due course that your glory lies where you cease to exist. What I'm suggesting to you is that your life is an episode in a larger story. And that larger story is the story of your soul. And when you die, when you go home, your friends who are five sensory, limited to the five senses, will put the date of your death on your gravemarker. But your multi-sensory friends will write ... to be continued! The spirit returns unto God who gave it. Reach up to the heights of the soul, and having sought and found that pinnacle of peace and that altitude of joy whereon your soul immovably stands, then looking into the world of "living" mena threefold world in which all menincarnate and discarnateare to be found. Find there that which your own soul can and will recognize. The glamours of one's own distress, the maya of the past, distort ever one's point of view. Only the soul stands clear from illusion, and only the soul sees things as they are. Mount, therefore, to the soul. Enlightenment for a wave is the moment the wave realizes that it is water. 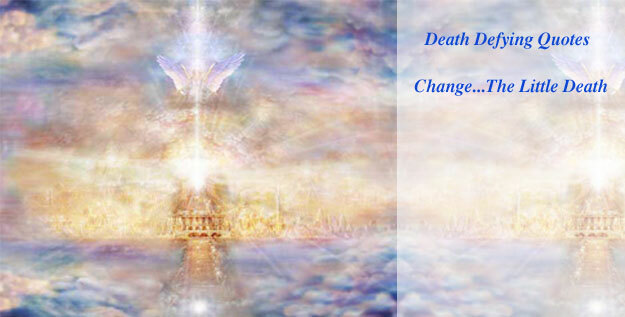 At that moment, all fear of death disappears. The more I observe and study things, the more convinced I become that sorrow over separation and death is perhaps the greatest delusion. To realize that it is a delusion is to become free. There is no death, no separation of the substance. It is the secret of the world that all things subsist and do not die, but only retire a little from sight and afterwards return again ... nothing is dead; men feign themselves dead, and endure mock funerals and mournful Obituaries, and there they stand looking out of the window, sound and well, in some new and strange disguise. Life is eternal, and love is immortal. Death is only a horizon and a horizon is nothing save the limit of our sight. Letting go of suffering is truly the hardest work we will do. We can't wait until our mind is clouded and the body wracked with discomfort to do work that seems so impenetrable. ... western culture doesn't recognize dying as a state of grace, nor the power of mercy and compassion. Freedom from suffering is when your happiness is no longer dependent on the content of your mind, but on the capacities of your heart. If you're not letting go of it, you're getting buried by it. I saw grief drinking a cup of sorrow and called out, "It tastes sweet, does it not?" "You've caught me," grief answered, "and you've ruined my business. How can I sell sorrow, when you know it's a blessing?" The whole world is a narrow bridge, a very narrow bridge, and the main thing is not to be afraid. It is in the nature of all things that take form to dissolve again. ... if the earthly no longer knows your name, whisper to the silent earth: I'm flowing. Before you leave the body, reduce one fool on this planet. And that is none other than you!" It is easier to resist at the begining than at the end.